Recruit maximum number of youth from Arunachal during Airmen Rallies to be held in the state. 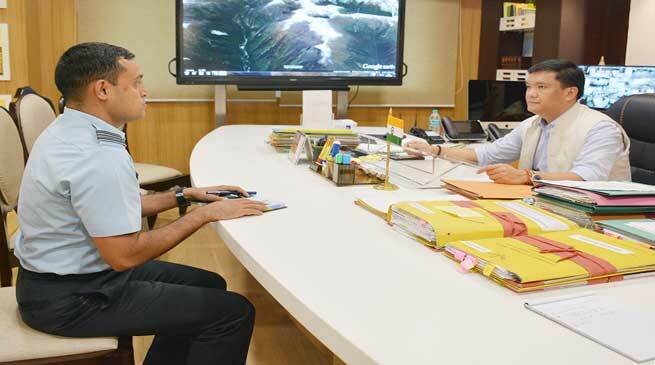 This request has made by Arunachal Chief Minister Pema Khandu in a meeting with Squadron Leader VPV Baliga, Commanding Officer, 11 Airmen Selection Center of the Indian Air Force. Mr Khandu assured state government’s full support and cooperation for conduction of the proposed Airmen Recruitment Rally in the state during October first week. The Indian Air Force will conduct two separate Air Men Recruitment Rallies at Itanagar on 1st October 2016 for the western zone and at Tezu on 5th October 2016 for eastern zone of the state. The Chief Minister underscored the importance of wide publicity of the rallies through local media and radio well in advance besides coordinating with the local administrations to attract participation of maximum number of youths. He also suggested sending the information to all schools and colleges of the state. Terming the rallies as an opportunity to serve in the elite Indian Air Force, Khandu appealed eligible youths, especially those unemployed, to take full advantage of the rallies. The Commanding Officer, who called on the Chief Minister this morning, informed that the rally at Itanagar will cover the districts of West Siang, Upper Subansiri, Kra Daadi, Lower Subansiri, Kurung Kumey, Papumpare, East Kameng, West Kameng and Tawang. While the one at Tezu will be for youths of Siang, Upper Siang, East Siang, Dibang Valley, Lower Dibang Valley, Anjaw, Lohit, Namsai, Changlang, Tirap and Longding. Highlighting the salient features of the rally, he informed that there is no vacancy limitation, however the selection will be purely based on merit and performance of candidates. Baliga further informed that candidates who pass 10+2 in any discipline with 50% aggregate and 50% in English or Diploma and those who are in the age bracket of 16-21 years will be eligible to participate in the Recruitment Rally.